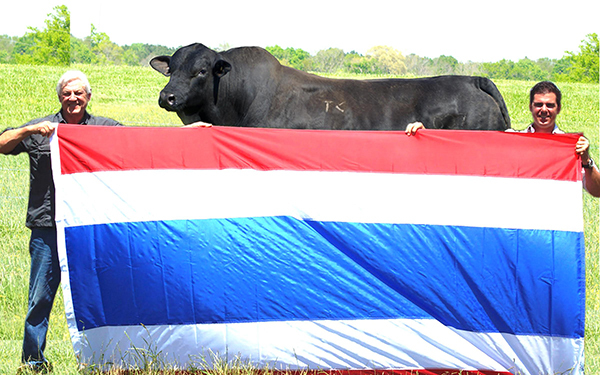 Town Creek Farm, West Point, Mississippi, is excited to announced that Brangus bull, TCF Rapid Reward 384B4, has arrived safely in the country of Thailand. In Fall 2015, Town Creek Farm began working with representatives in selecting a Town Creek Farm herd sire for export to Thailand. The chosen bull underwent pre-entry testing followed by a 30-day official quarantine period. During that time, additional testing was conducted to satisfy Thailand’s stringent entry requirements. Throughout the export process, Town Creek Farm worked closely with the Mississippi Board of Animal Health and the United States Department of Agriculture. After 384B4 was cleared for export, he was transported from Town Creek Farm to Louisiana, and then on to Texas to join a handful of Brahman cattle to make the journey. The cattle were boarded on a plane in Chicago, Illinois, and were flown to Thailand. 384B4 went into isolation upon arrival in Thailand and then will be transported to his new home. Town Creek Farm bulls were specifically selected for this project due to their environmental adaptively, moderate birth weights, early maturing patterns, maternal and carcass qualities. From the 1960s to 1980s agriculture employed around 70 percent of Thailand’s active working population. Today, Thailand’s economy is an interesting blend of a strong agricultural sector with a developed manufacturing sector and stable service sector. Thailand is located on the continent of Asia. Thailand’s climate is tropical with a mean annual temperature of 82 degrees with high humidity. Town Creek Farm Brangus cattle are easily adaptive to Thailand’s tropical atmospheric conditions. Town Creek Farm is among the leading Brangus and Ultrablack seedstock operations in the United States. Town Creek Farm foundation genetics have been exported to countries of Australia, Brazil, Paraguay, and Uruguay. Milton Sundbeck, West Point, is owner and operator of Town Creek Farm.